Consumers historically had the choice to prepare fresh vegetables or pickup frozen vegetables from the freezer aisle. In 2018 the growing trend by Coles own brand is packed prepared vegetables in a range of functional packaging. Removing the need to wash and prepare vegetables when preparing meals. 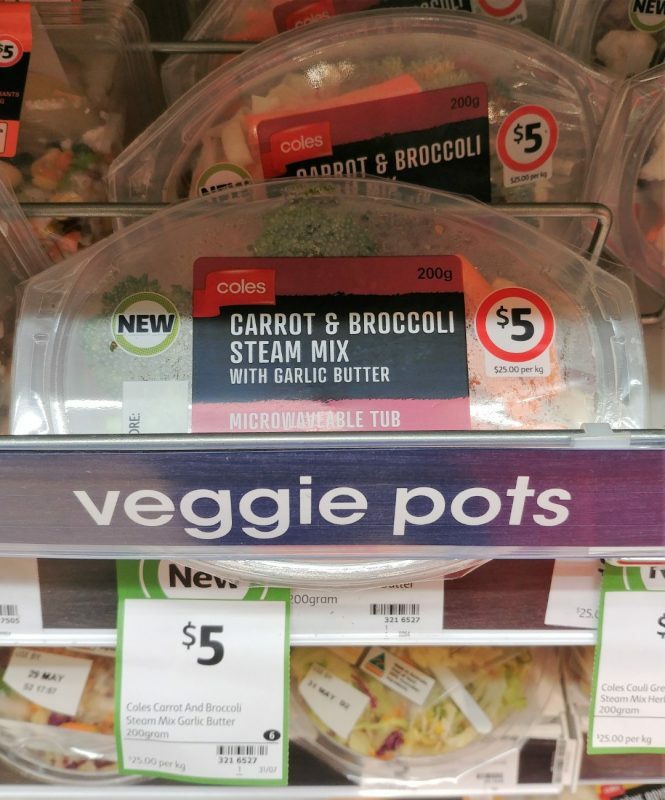 Coles vegetable steam mix ($25/kg) available in a range of different vegetables mix with garlic butter in a microwaveable plastic tub. Simply place in the microwave for steamed vegetables then add to your meal for an instant accompaniment. This is not a new concept as Birds Eye has a range of SteamFresh ($5.33/kg) frozen vegetable mix in individual steam bags. Although frozen or fresh vegetables provide the same nutritional value the Coles preparation of vegetables resemble homemade (random chunky cuts) were Birds Eye has the typical frozen vegetable appearance. 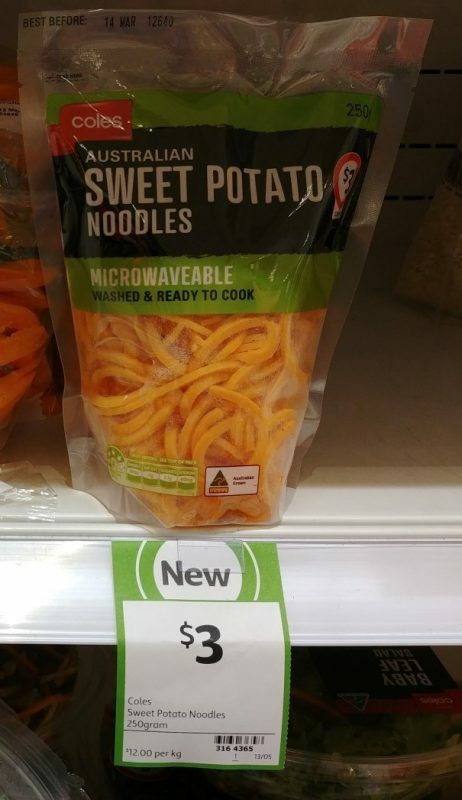 Also available in a microwavable pouch is Coles Australian Sweet Potato Noodles ($12/kg) for an easy addition to a meal. Also other easy addition vegetables to add to a meal are Coles Superfood Stir Fry Mix ($13.33/kg) washed and ready to cook. 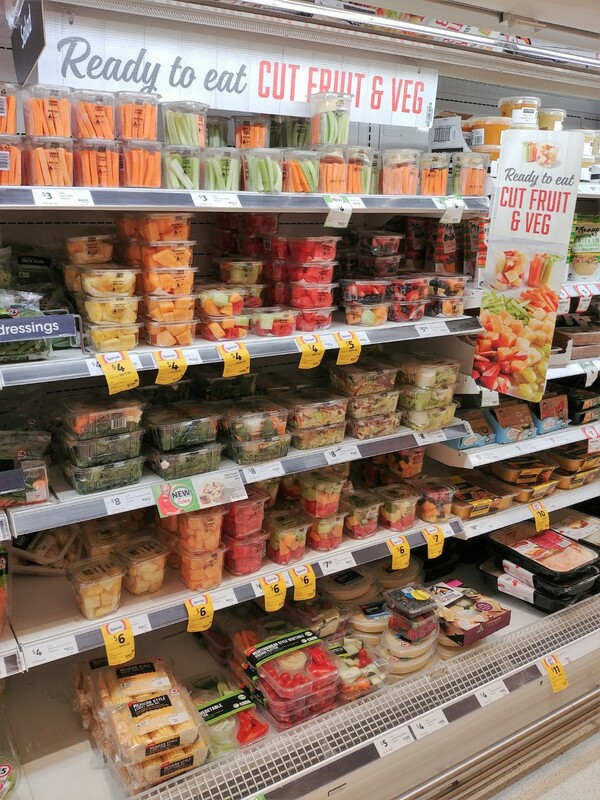 Keeping on trend, packaged prepared and value added fresh vegetable are also available in the same location. 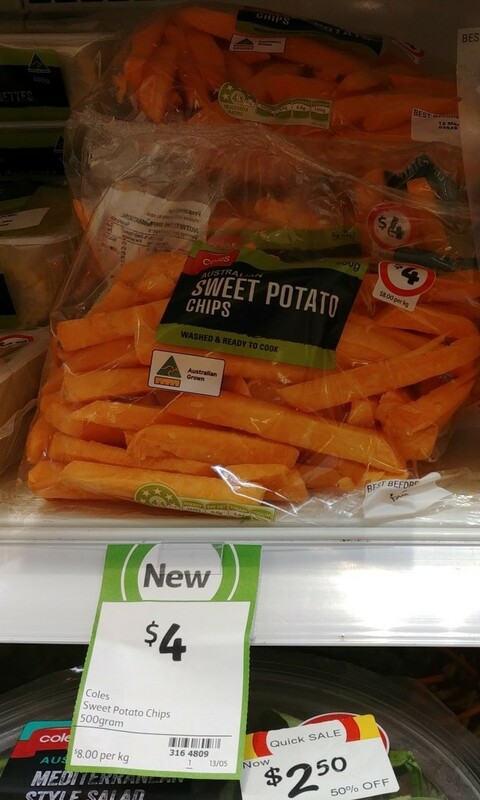 Coles Sweet Potato Chips ($8/kg) washed and ready to cook provides convenience and flexibility to season to own tastes compared to frozen varieties which are similar priced. 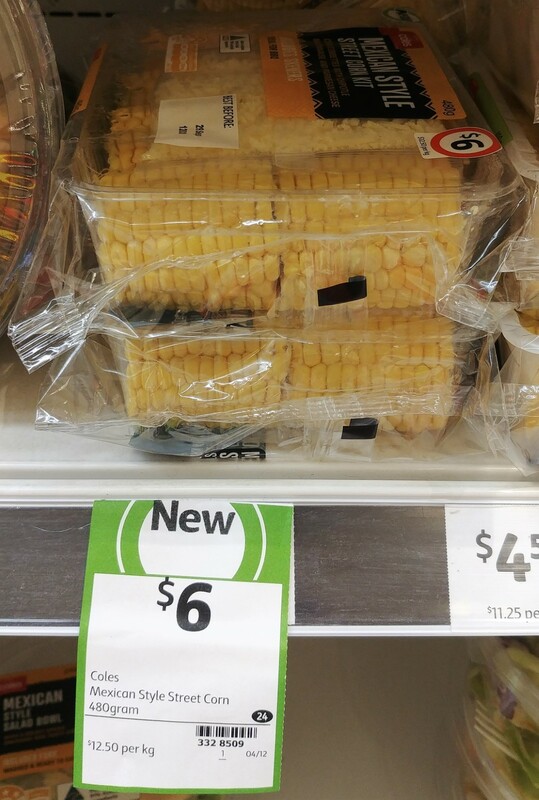 Another prepared product which has been valued added is Coles Mexican Style Street Corn ($12.50/kg). It is cut and husked corn with Chipotle sauce and cheese. Plastic reduction becomes increasingly important for consumers as the two major retails Coles and Woolworths no longer provide free plastic bags at the checkout. 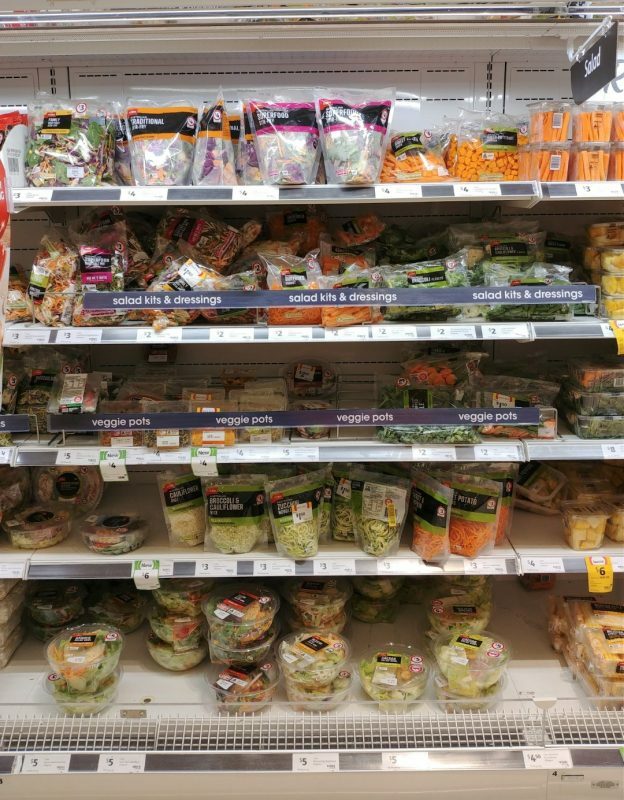 The need to package fresh vegetables in plastic for convenience has been met with heavy resistance given the fresh item is sitting on the shelf nearby. Manufactures need to find the balance in packaging design between value added and providing functional packaging. In summary the segment of convenience vegetables set to grow and expand as retailers are starting to move beyond cutting vegetables or grouping together and wrapping in plastic. Advancements in packaging is helping to shape this segment to steam cook and heat via a microwave. 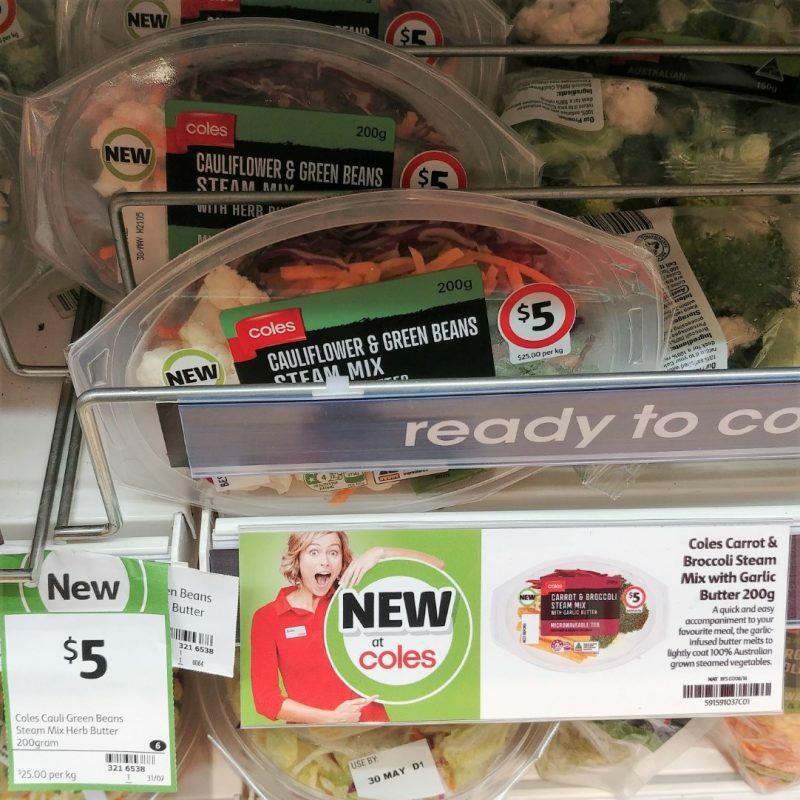 Currently dominated by the Coles home brand expect to see this segment grow and branded manufactures moving into the space. 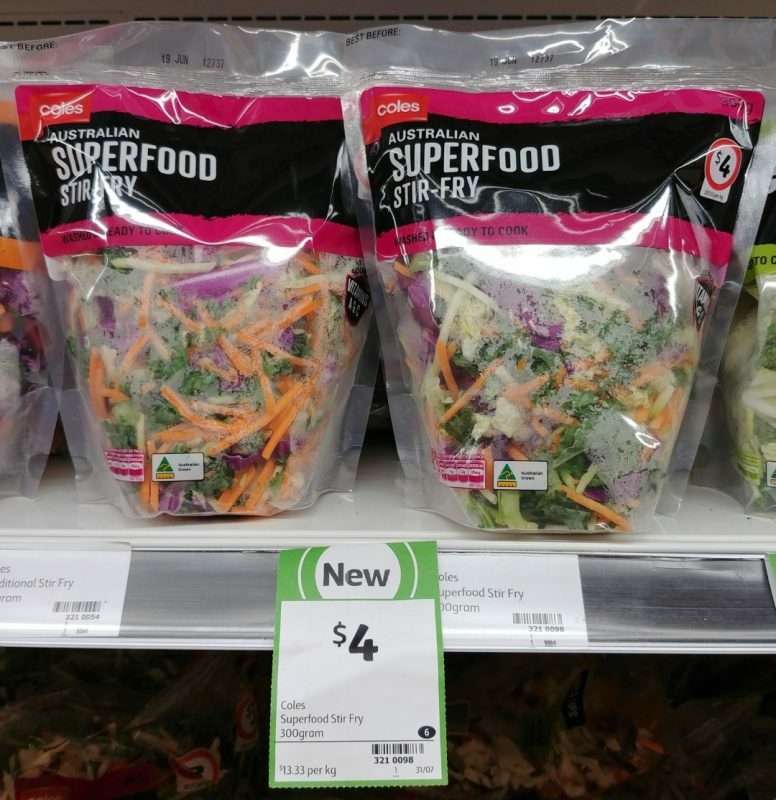 This entry was posted in Trends & Insights and tagged 2018, Coles, Convenience, Corn, Insights, Steam Mix, Stir Fry Superfood, Sweet Potato Chips, Sweet Potato Noodles, trends, Vegetables on 04/12/2018 by KS. In the bakery category, sprouted grains products continue to grow in USA making it a worthwhile expansion with key considerations to factor at product development. The consumption of sprouted grains has a number of positive health benefits making it a nutritious offering in the bakery segment. 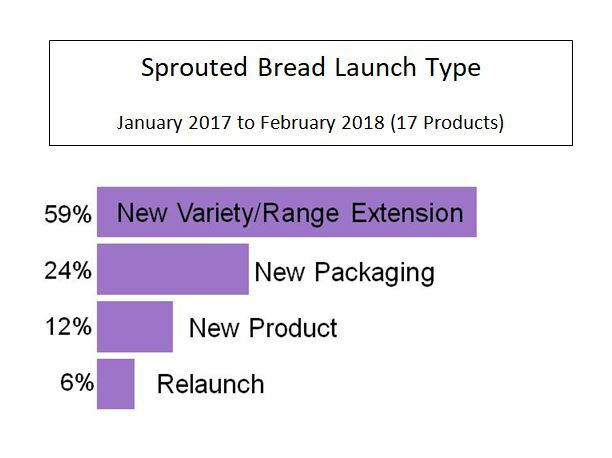 According to Mintel Global New Products Database (GNPD), of the 17 sprouted bread products launched from January 2017 to February 2018, 71% were either a new product or a variety/range extension. Manufacturers are noticing this growing momentum as they move into this space and by focusing on key product attributes during product development can capitalise on this trend. There are some initial challenges needed to be considered when entering this new category. Due to the nature of the sprouting process from starch to simple sugars consumers may find the taste being nutty, malted or bitter. In addition, the shelf life is generally shorter which will impact on manufacturing baking schedules and supply chain. The move from the traditional shelf space to chilled/freezer section for extended shelf life may present more implications. By combining GNPD with Mintel’s Purchase Intelligence data we are able to analyse how consumers perceive the sprouted bread based on specific attributes. Sprouted bread maintains its health halo with high natural and healthy attributes. On the other end of the scale consumers believe sprouted bread is lacking in taste, good value and excitement. Digging deeper into Mintel’s Purchase Intelligence reveals how each perceived attribute correlate to purchase intent. Sprouted breads show strong natural and healthy attributes however reveal low purchase intent. 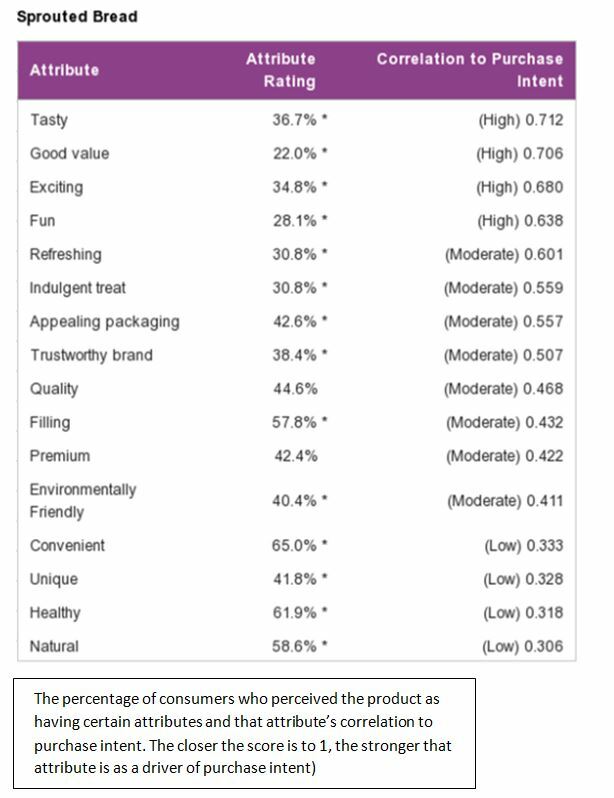 While the following attributes Taste, Good Value, Exciting and Fun have high purchase intent with the lowest attributes. This provides the frame work on the main considerations in the expansion into the sprouted grain bakery market. Formulation development; identifying competitor products to bench mark and regular taste panels is fundamental during the development to win over consumers. Can the nutty/bitter taste be incorporated into the overall flavour profile in the finished product? Another strategy is the use of masking flavours for specific taste profiles (for example bitter) to cast a wider net of consumers. Packaging / positioning has a key role to play for communicating to the consumer as it creates an immediate impression. As marketers look for new ways to attract consumers the attributes exciting / fun which has high purchase intent. Exploring new packaging materials such as thermoforming in rigid film to increase shelf life and differentiate from the current plastic LDPE on the market. The last consideration is pricing strategy to capture the high purchasing attribute good value. Sprouted bread products shelf price is 16% higher than grain bread while being 4% less product weight. Providing good value requires a combination of shelf price and/or branding core values, this in turn will translate to good value options for the consumer. This could include extending the brand identity with the sprouted bread launch under the brands name umbrella enabling the strengths of one product to influence consumers attributes of another. As the sprouted bread category in USA develops, manufactures and brand owners need to focus on key attributes during the new product development process to capitalise on this growing trend. This entry was posted in Uncategorized and tagged Mintel, sprouted bread, trends, USA on 26/11/2018 by KS.